The idea of a "sensible shoe" has always made me laugh. Why? Besides the fact the statement takes me back to Ye Olde decades, it makes me laugh primarily because I don't need a sensible shoe. The shoe is not my accountant or my babysitter so sensible is not the word I want to use to define my footwear. Now, on that note, I am not the girl who wears a steep heel and midway through the night is complaining about barking dogs (Do you know this expression by the way? How Archie Bunker is this? "OH my dogs are barking!" ) I have never once ended an eve barefoot with heels in hand because I made a poor shoe choice. And I love the heels (need I remind I was wearing heels the day I went into labor). Now, I go for the good stuff and ensure they fit well before I wear. Also, I learned a great trick especially for summer: When feeling the tightness from the summer heat: Vaseline that foot anywhere you feel the burn. PRESTO: magic. Not a blister to be had. Now, even the heel aficionado I am, I know when to say when. Pregnancy aside, you wouldn't see my spending the day in heels when it is either inappropriate (gym, playing at the park) or downright silly (gym, playing at park, walking around Chicago or NYC). The tiny problem has always been: I have lacked the perfect "walk around" shoe that embodied all I wanted: functionality, comfort, and a heel. I am not a tennis shoe wearer unless I am working out or running so tennis shoe is not a good choice. And don't get me wrong, I havent wasted precious time on this, I just accepted I would not have the perfect option which is a perfect walk around shoe for any attire. Oh, okay, I am a little atypical in that I will not wear flats. I have not liked them since about 9th grade and just cant patch up that relationship. All those pretty ballet flats are great, just not for me. So while a good bit of ladies have added darling flats to their repetoire, I have gone without. Until one addition last year and another this past summer. And now, I have hit the Motherload. Let me share. First: The FitFlop. Here is my take: If you are asserting I will burn more calories as I walk on your foamy cushion of delight, that my feet will never tire, never waver, never blister, well you had me at "biomechanists". My mom made this discovery and when she first tried to buy them for me, there was a rumored waiting list. Really. The Birkin Bag of Shoes? Well, she prevailed and let me tell you, I would have waited. Regular flip flops do not support the foot, which is critical since the foot supports your entire being. This is a great shoe in multiple colors and I wore them today and I scuttled little man to and from school. 'Nary an eyebrow raised at this fabulous choice. And they make a men's version too. Now, moving along to my most recent summer fling that turned into a full blown committment. Oh Crocs Cyprus, where have you been all my life? Now before you peek, lets talk about the Crocs. Do you remember when this gardening clog became a national phenomenon? Listen, I don't know how it happened either. 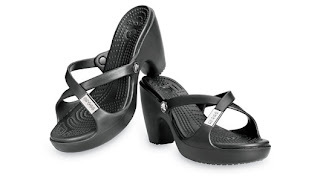 I realize the Croc never wanted to be the Prom Queen Shoe but there is unattractive, and then there is this gardening clog. And while they are purported to be comfortable on the feet, they are uncomfortable on the eye. Very. They are a misshapen plastic potato with ventilation and a strap. Boo. Now mind you, my adorable son has a pair because he wanted some just like "Grandpa" and on him, precious. But the gardening clog should have certain restrictive uses. Grandpa uses his around the house and their large garden. So unless you are two, or at least under the age of twelve, OR actually have a garden...I think you know where I am going. However, Crocs as a company has evolved and now has more options than a Rubiks Cube. And Crocs Cyprus? Well, you can just show me the way home honey. This is a shoe that lacks the ugly duckling face of its elder. I have been waiting for you for a long, long time. Comfort is the most important ingredient in this shoe and I have worn it everywhere. 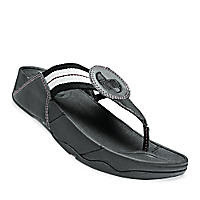 Its a sleek and upscale version of what I needed from the FitFlop. Thank you! And I have worn them under a ball gown not because I tried to hide them in shame, but because that was a long dress, and well, I know when to be wise. This is the shoe that will not only never make your dogs bark, it will likely have your dogs shakin' that moneymaker late into the evening asking for another round of champagne. Try them, your feet will bless you. And should we ever really need to use the phrase "sensibile shoe" then let's just give it a little upgrade shall we?